This is another recipe I used during my parents visit to San Diego (I’m getting a lot of mileage out of that, huh?). 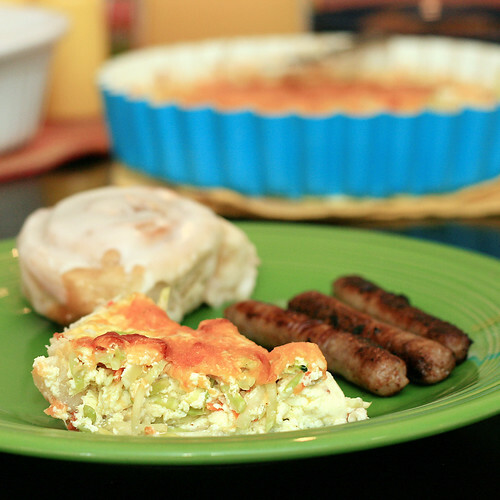 We had this for breakfast on Sunday, along with the most amazing cinnamon rolls (will be posting next week!). The only thing I regret is not getting a better picture of this Quiche because it was so incredibly good and the picture just doesn’t do it justice. The smooth and creamy custard paired perfectly with the slightly bitter and subtly spicy slaw. Even my dad, who was skeptical of eating Quiche, enjoyed this. It worked out perfectly that we ate such a big breakfast that day because we went out exploring and didn’t have time for lunch. 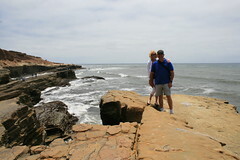 Friday, we had gone to see the Cabrillo National Monument, which has an absolutely amazing view of San Diego. We walked all around the eastern portion but didn’t have time to explore the west side of the peninsula which overlooks the Pacific ocean. Sunday, we decided to go back and explore the tide pools and navigate some cliffs. We all appreciated the good breakfast and full bellies we had when we were doing all of that walking down and then up cliffs. Much like life you can walk as far down as you’d like, just don’t forget the climb back up is 10x harder! A side note, this picture was taken within a few minutes of the other pictures, this one is facing east and the others are facing west. Isn’t the change in the color of the sky amazing? One minute there are a few clouds the next the sky is covered. All 3 pictures are unedited! Preheat oven and a cookie sheet to 375 degrees. Rack should be positioned in the middle of the oven. In a medium bowl (with a pouring spout, if you have one! ), whisk together eggs, half and half, garlic, nutmeg, and hot sauce. Carefully transfer the pie crust dough to a 9-inch pie pan. Place the Broccoli Slaw on top of the pie crust then pour the egg mixture over top. Sprinkle cheese over the top. Bake 30-35 minutes. Cool at least 20 minutes. * I had initially planned on making my own pie crust, but time got away from me so I used a store bought one I had in my freezer. This was not a good idea! The crust did not have the texture/flavor I was looking for which was disappointing because the quiche itself was so good. Once before I made quiche with a pre-made crust that was already in tin pan and that was better than this crust, but I will still make my own next time! In an effort to keep myself occupied and make the first weekend with out Jesse more bearable, I did what any self respecting girl would do, I shopped. In Ohio, I loved shopping at the new Premium Outlets in Monroe. I knew that the Premium Outlets were part of a country wide chain so when I found out we were moving to San Diego I did a little research to see if there was one close. Lucky for me there are two. One in Carlsbad, about 30 minutes north of us, and one near the border of Mexico, about 30 minutes south of us. Today, I decided to venture north and I went to the Carlsbad outlets. I’m pretty sure I heard angels singing when I saw the sign for the Crate&Barrel outlet. A colorful girl’s dream. I love that there was a palm tree right outside of the Coach outlet! Palm trees are one of my favorite things about living in San Diego. And, if you’re ever in Southern California you need to try find a Ruby’s near you. They have awesome burgers and even better sweet potato fries. Plus a really fun atmosphere. It’s hard to tell in this photo, but right behind the outlet mall is a HUGE, like 6 acres, flower bed. The flowers were so pretty. Finally, my loot. All for under $45!! Sometimes Jesse and I set out for a drive with no particular destination in mind. 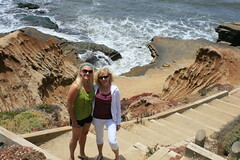 We love exploring San Diego and seeing all of the surrounding areas. 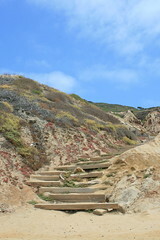 One place that we often wind up at is the Torrey Pines Glider Port, right behind Torrey Pines Golf Course. There are incredible cliffs and a really awesome view of the ocean. As the name obviously states, it is also a glider port where people take off for a glide over the ocean. One day I am going to get the guts to try that, one day. This past Sunday we once again found ourselves at the glider port. As we were getting out of the truck we saw a squirrel. Jesse insisted on getting a few cookies from the truck to try and lure it closer. I know that you are really not supposed to feed wild animals because it messes with the whole balance of nature and normally I wouldn’t but we did (technically Jesse did, I wasn’t as interested in being friends with them) We obviously were not the first people to do this because the squirrel(s) knew exactly what was going on. Suddenly more came from the bushes and they slowly worked their way closer and closer to us. Then the craziest thing happened, one of the squirrels came right up to Jesse and ate the cookie right out of his hand! And THEN one climbed right in his lap! We could NOT believe how outgoing they were. They didn’t seem scared of us at all. I actually got up and moved further away because, like I said, it was Jesse that was their friend, not me! Luckily I had my 70-300mm lens to capture the whole scene from a safe distance. And not to worry I asked Jesse to use hand sanitizer as soon as we were finished.